In a group of nine museum studies students, collaboratively develop a 5,000 square foot object-based exhibition, using the University of Pennsylvania Museum of Archaeology and Anthropology’s Oceanic collection as a starting point. Culture is shaped by many factors. 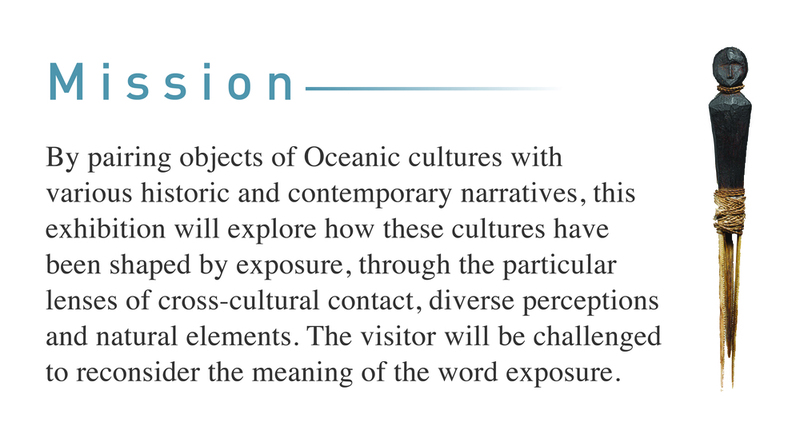 We developed an exhibition about how Oceanic cultures have been shaped through three types of exposure: exposure to environmental elements, other cultures and perceptions - both internal and external. Defining exposure as “a catalyst for change,” the exhibition encourages visitors to explore how Oceania has been shaped by exposure and reflect on how this evolution has occurred in their own personal cultures. To see the design of the exhibition, please click here. For more detail about this project, please download the full package.